It’s now June and the rains have not relieved the drought we have here in California. All of our crops are being affected, but it’s the tomatoes that I’m thinking about today. I don’t know what I would do without my pasta sauces. With limited rainfall to help flush the salts or to irrigate the crops in summer months, growers will need help to obtain quality yields. Incorporating Accomplish LM into a standard fertility program can really assist here. Accomplish LM mineralizes nutrients and increases root size and branching so that more of the root system can take up nutrients and water. 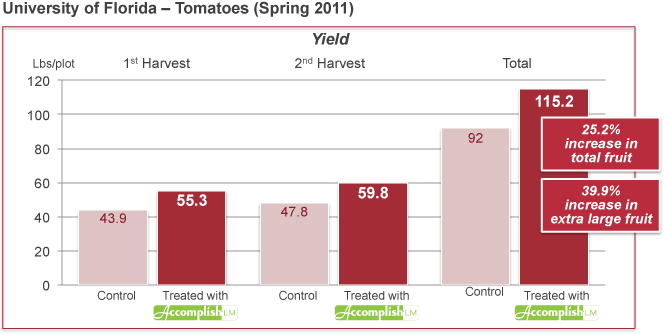 The result is better plant performance and higher potential tomato yields (Figures 1 & 2). Agricen has been working with the Institute of Food and Agricultural Sciences (IFAS) at the University of Florida to evaluate the effects of our biochemistry-based technology, found in plant nutrition tools such as Loveland Products’ Accomplish LM, on tomato yields. 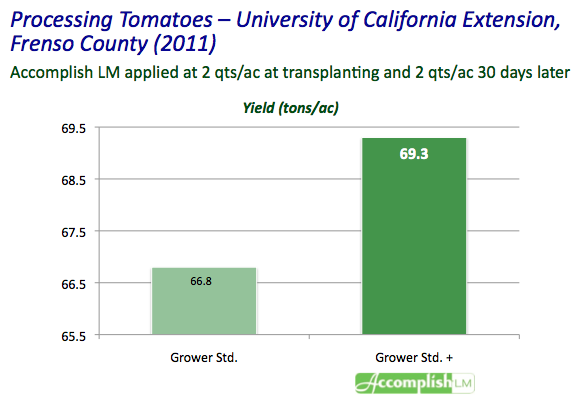 The most recent data show that adding Accomplish LM to a plant nutrition program for tomatoes significantly increases fruit yields and size.